President Trump is obsessed with reducing the trade deficit, and he has a new number that he can’t stop talking about. Since the Commerce Department released a report July 27 showing that the gross domestic product rose at an annual rate of 4.1 percent in the second quarter, the president has repeatedly mentioned a trade figure you can find only by going deep into the report and doing some arithmetic. He has even wondered why reporters have not mentioned this astonishing bit of news. Well, reporters have not written about it because the way he talks about it is misleading and wrong. Our friends at FactCheck.org first pointed out the faulty math, but we can’t resist taking a look at this new favorite talking point ourselves. A White House official explained that the president was referring to information that can be found in Table 1.1.6 of the second-quarter GDP report. When discussing quarterly GDP figures, it is customary to refer to an annual figure for the GDP — in this case, $18.5 trillion — which is expressed in chained (2012) dollars at seasonally adjusted annual rate. There are four key components that go into the calculations of the GDP — personal consumption expenditures, domestic investment, net exports and government expenditures — and this table breaks down the $18.5 trillion figure. It shows that the trade deficit was $902.4 billion in the first quarter and $849.9 billion in the second quarter, for a difference of $52 billion. It might sound like the president is on solid ground, but he’s not. Trump keeps saying that this is how much the trade deficit fell from quarter to quarter. But remember, these figures are expressed as annual numbers. So if you want to know what the difference is between two quarters, you need to divide by four, according to an official at the Commerce Department and economists we consulted. “Dividing the GDP trade values by four will result in quarterly rates,” the official said. Moreover, if you wanted to talk about the actual trade deficit, as Trump does, you would not use the inflation-adjusted figures but the current-dollar figures. In the GDP report, it shows that on an annual basis, the trade deficit fell by $86.8 billion. Divided by four, that turns out to be $21.7 billion. As it happens, the Commerce Department issued a new report Aug. 3, a week after the GDP report, on trade flows in the second quarter. It showed that the trade deficit was $155.6 billion in the first quarter and $135.6 billion in the second quarter, for a decrease of $20 billion. There are slight differences in what data is collected and reported in what are known as the international transactions accounts (ITAs) and the GDP accounts, but you can see that the result is roughly the same — about a $20 billion decline in the trade deficit from quarter to quarter, not $52 billion. Even a $20 billion decline may not be cause for celebration, because many experts think that the data was affected by the fact that companies overseas rushed to buy U.S. goods before Trump’s tariffs took effect. Net exports, for instance, added a full percentage point to GDP in the second quarter — an unusually high addition from that source. Goods exports also jumped from 8.1 percent to 8.4 percent of GDP in the quarter. So the gain in exports may be a one-time blip that is reversed when the third-quarter data rolls in. The monthly trade data shows goods exports hit a high in May but then started to dip in June, after the tariffs went into effect. For the first half of 2018, the trade deficit has grown to $291.8 billion, which is almost $20 billion higher than the first half of 2017 — putting the nation on track to have the largest annual trade deficit since 2008. The White House official defended the use of the $52 billion figure, saying it was consistent with how GDP is expressed — in annualized, inflation-adjusted dollars. “Your point about the trade deficit going up in first half of 2018 is only true on a year-over-year basis. But the 4.1% headline number, and all the investment numbers we reported, are seasonally adjusted annual rates in the second quarter for the four quarters of 2018,” the official wrote in an email. We stopped getting responses to our queries when we persisted in asking why the numbers were not divided by four, as would be standard economic practice for comparing quarterly changes in the trade deficit. We doubt the president himself is digging into the details of the GDP report, so either he is being misled by his staff or misunderstood something in a briefing. He may be very disappointed when the third-quarter numbers are released, given that the year is already on track to have the largest trade deficit in a decade. 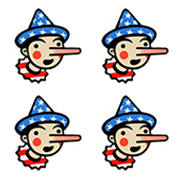 We generally are reluctant to give Four Pinocchios for a factoid based on government data. But the president is presenting this in such a misleading manner that we have little choice. In every instance, the president says the trade deficit fell by $52 billion from the first to the second quarter, calling it one of the “biggest wins” in the GDP report. He may be convinced of it, but that’s simply not true.